The 2008 Sichuan earthquake at a magnitude of 8.0 Ms. 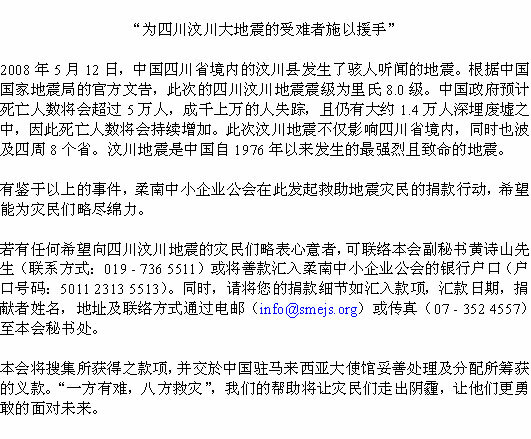 According to the State Seismological Bureau of China occurred on May 12, 2008 in Sichuan Province of China. The Chinese government warned that the death toll could reach 50,000. Tens of thousands are missing, approximately 14,000 of them buried, and eight provinces were affected. The earthquake left about 4.8 million people homeless. It was the deadliest and strongest earthquake to hit China since 1976. In view of the above, SME Johor Selatan has taken the initiative in asking for assistance for the earthquake victims. For those who wish support, kindly contact our Asst Secretary Mr Ng See Sun at 019-736-5511 or bank-in the financial assistance to our Maybank Account No: 5011-2313-5513. Kindly email us ([email protected]) or fax to us at 07-3524 557 the details including amount bank-in, date bank-in and the contributors name, address and contact number. The association will channel all fund collected to the Embassy of the Peoples's Republic of China for onward distribution to the intended victims. Together, we can make a difference to the earthquake victims.